I love to cook, and I love to eat! I spend a lot of time online researching food facts, nutrition, and ingredients to create many of my own recipes. But ever since the elevation of the “celebrity chef” to near god-like status, trendy food styling and ingredients are out of control. Food topics are now “above the fold” and recipes are breaking news. Don’t get me wrong. I love the attention given to the wonderful variety of foods available in our modern grocery stores. And we’re a long way from the meat and potatoes diet our grandparents lived on. Advances in nutritional science have created changes in that old “food pyramid” from an emphasis on carbohydrates to vegetables and fruit. It’s just those pesky trends that continue to irk me. I don’t know about you but I‘m pretty much done with the laundry list of fads that continue to assault this foodie’s semi-purist sensibility. Personally, I’ve had it with Buffalo-style anything, especially chicken wings—possibly the most unhealthy part of the beloved bird. Then there are chipotle peppers, chimichurri, salsa, red pepper flakes, and hot sauce in everything! Let’s dial hot, spicy foods back a bit so we can taste the delicate flavors we love. When did cilantro become a staple? TV chefs are putting the soapy, nasty herb in dishes that never rubbed elbows with it before! When I saw a cook assaulting some beautiful grilled salmon with cilantro, I wanted to—well, let’s just say I was not happy. And what’s up with kale? Chefs are putting it in places it’s never been before. Cooked, it has a strong, bitter, “cabbagey” flavor; raw, it’s tough, like chewing on elephant ears. Yum. Give me more of that. Actually, I still prefer spinach, romaine, and leafy lettuces—so tender, crisp, and sweet. Then there’s presentation. Stacking food in the middle of the plate has been a popular serving style since the 1980s, but I hated it then, and I hate it now. It’s pointless (you still have to level off everything to get at it), and it’s dangerous (ever try carrying plates loaded with towers of food to a table of hungry teenagers?). My recipes will never ask for kale, cilantro, food towers, or trendy anything. I can’t guarantee gluten-free either. I try to buy organic vegetables, meat, and eggs, and steer away from foods that aren’t non-GMO. I’m not perfect so I leave it to you to make food choices you are comfortable with. Here’s an easy, quick, and delicious way to start. Happy eating! Always available, always a bargain, and always easy to prepare, orzo is rice-shaped pasta kids and adults alike enjoy. Combining beans with vegetables makes a nutritious dish you and your family will love. If you feel the need for a protein, add diced poached chicken or shrimp. No hot sauce required unless you like it! In a large pot over medium high heat, add olive oil and heat until shimmering. Add red bell pepper, green bell pepper, garlic, and onions. Sprinkle with salt and sauté for 3-5 minutes, until just softened and fragrant. Add cumin, chili powder, salt, and pepper and stir until combined. Add the black beans, diced tomatoes, corn, and orzo. Stir to combine. Slowly add the chicken stock then bring mixture to a boil, turn the heat to medium low, cover and let simmer until orzo has fully cooked through and absorbed most of the liquid, about 13 minutes, stirring occasionally. Serve hot with warm flour tortillas or in lettuce cups. Pass the shredded jack cheese. Is there a food fad you love to hate? I’d love to hear from you. You can also send me your favorite recipes. If I use them in my column or blog I will credit you. Let me know at my new blog address, http://www.cooksjournalblog.com, where you can comment, follow me, and receive and print out every post sent directly to your inbox. Saving time in the kitchen conserves a cook’s energy and saves money. Seasoned cooks know many of these tips and basics, but if you’re new to the culinary world, you’ll appreciate learning these bits and basics. Cooking is a sort of chemistry experiment, after all. Mixing acids and bases and applying heat qualifies as science, so results should be consistent and predictable. So even if you flunked chemistry in high school, you can apply these principles with great success! Check out part-1 and part-2 tips and tricks columns on this blog, too. Onions – Too strong and pungent? Learn how to slice them first: cutting down through the width into rings will give you a lot of exposure to ruptured onion cells thus lots of tears and smelly fumes. Cutting into the side of the onion will give you less cell rupture and more friendly slices. TIP: After slicing either way, rinse with hot water for 45 seconds. Trust me—the onions won’t wilt because the pectin that holds the plant cells together won’t melt till 185°, and tap water is usually around 140-150°. Onion slices will now be sweet and less pungent. Beans – When cooking dried beans, always salt the soaking and cooking water. Salt helps the skin stay intact and tender, preventing beans from “blowing out.” And always add your fully cooked (softened) beans to chili or baked bean liquid. Cooking them in an acidic stew of molasses or tomatoes before they are soft will toughen them or blow them out. Crème fraîche is easily made at home by mixing 2 Tbs. of buttermilk with 2 cups of heavy cream. Set aside on the counter covered with a tea towel 6-12 hours till thick. Afterward, store in a closed jar in the refrigerator for up to 2 weeks. How fresh are your eggs? Most cartons display a sell-by date and a packing date. The packing date is a 3-digit number above the sell-by date with 001 for January 1st to 365 for December 31. Always use this to determine freshness as eggs must be packed no later than 30 days after they are collected. Refrigerated eggs stay wholesome for 70 days. Fresh farm eggs (not commercially distributed) need no refrigeration because they are laid with a built-in “cuticle,” a natural waxy coating that seals the eggs’ contents keeping bacteria out and moisture in. Commercial eggs are washed and lose that protection so they need refrigeration. Test your eggs’ freshness by submerging them in water to cover. 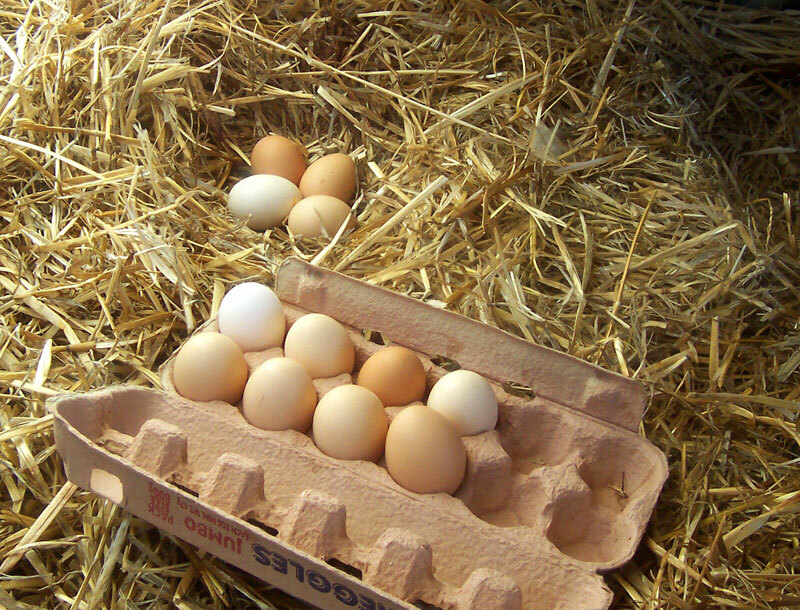 Older (but safe) eggs will stand up because a little air has gotten into the shell. Really old eggs will float and should be discarded. Egg shell color has no effect on its quality or flavor. Color varies according to the breed of the chicken. Skin is easily peeled from many fruits and vegetables (peaches, tomatoes, etc.) by placing them in boiling water for a few minutes then lifting them and plunging in ice water (this is called shocking). Skins will peel right off. When beating egg whites for meringue or other uses, place egg whites in an immaculately clean metal or glass bowl, and be sure beaters are also completely clean. Any trace of grease or oil (or yolk) will prevent the whites from frothing properly. When preparing strawberries for shortcake, hull and slice them, then sprinkle generously with sugar, toss, cover, and refrigerate for a few hours. This will bring out the juices in the fruit. Muffin batter should sit for about 20-30 minutes before it is placed in tins. The extra time allows the baking powder to work its magic for higher, lighter muffins. Always let meat rest after cooking. Juices excited by extended periods of heat need to settle before any meat is cut. This means steak, roasts, chicken—anything.